anmlbskta         "Animal Basket (19 Jan 2005)"
belslots          "Bel Slots Export (5.01)"
bigdeal0          "Big Deal Belgien (5.04)"
bounty2           "The Bounty (set 2)"
cburnrubj         "Burnin' Rubber (DECO Cassette) (Japan)"
cgraplopj         "Graplop (DECO Cassette) (Japan)"
clocknchj         "Lock'n'Chase (DECO Cassette) (Japan)"
cptennisj         "Pro Tennis (DECO Cassette) (Japan)"
dbox              "D-box 1, Kirsch gruppe"
dcat16            "D-CAT16 (Mega Drive handheld)"
dngrtrck          "Danger Track (Rally X bootleg)"
eswatbl2          "E-Swat - Cyber Police (bootleg, set 2)"
gteikokub3        "Gingateikoku No Gyakushu (bootleg set 3)"
gwarab            "Guerrilla War (Version 1, set 2)"
mach9             "Mach-9 (bootleg of Vulgus)"
mmaze2            "Marchen Maze (Japan, hack?)" monymony2         "Money Money (set 2)"
motoraiddx        "Motor Raid - Twin/DX"
ncentury          "New Century (Spanish bootleg of Scramble)"
offensiv          "Offensive (Spanish bootleg of Scramble)"
othunderjsc       "Operation Thunderbolt (Japan, SC)"
outr2stjo         "OutRun 2 Special Tours (Japan) (GDX-0011)"
pcnfrk5m          "Percussion Freaks 5th Mix (G*B05 VER. KAA)"
pepk1002          "Player's Edge (PK1002-PC082) Jake's Jacks Bonus Poker"
pjoyn50           "PowerJoy Navigator 50 in 1"
pjoys30           "PowerJoy Supermax 30 in 1"
pjoys60           "PowerJoy Supermax 60 in 1"
potnpkri          "Jack Potten's Poker (set 10, ICP-1 PCB)"
powerinsp         "Power Instinct (USA, prototype)"
sarc110           "Super Arcade 110 (set 1)"
sarc110a          "Super Arcade 110 (set 2)"
spectarrf         "Spectar (revision 2, bootleg)"
tehkanwcd         "Tehkan World Cup (set 4, earlier?)" ultracin          "Waku Waku Ultraman Racing"
gteikokb -> gteikokub      "Gingateikoku No Gyakushu (bootleg set 1)"
gteikob2 -> gteikokub2     "Gingateikoku No Gyakushu (bootleg set 2)"
palamed -> palamedj        "Palamedes (Japan)"
vsmile -> vsmileg          "V-Smile (Germany)"
alpilota -> alpilotj       "Airline Pilots (Rev A)" -> "Airline Pilots (Japan, Rev A)"
alpiltdx -> alpilot        "Airline Pilots (deluxe) (Rev B)" -> "Airline Pilots (World, Rev B)"
There is no entry for "tehkanwcd" in marp, why is that? PP. wrote: There is no entry for "tehkanwcd" in marp, why is that? If you are looking at the leader board "1st" or "Top 3", you need to wait a day for MARP to process my changes (this happens overnight). In the meantime, I believe you can still submit scores. ***PL*** wrote: In the meantime, I believe you can still submit crappy scores. Your brain is crappy. You're trying to arouse me again... you don't even respect yourself. Btw, Stephen M. Krogman has recently uploaded 24 scores of place 3-20, is he a crappy uploader for you too? You are not in position to judge which score is cheap, you are ignorant. Only a few people can make 722 or so in tehkanwcd. Just stop bother me with the "crappy/cheap scores" drivel. The word "respect" is unknown to you. You're out of your mind if you believe that I can't get a soccer scoring tile by just watching an inp/YT video and apply it. You're out of your mind if you believe that I can't get the scoring tile by just watching an inp/YT video and apply it. What kind of joke is this? You mean that you can do the deposited score of any game, just by watching how in the inp? I don't see your name in the tehkanwc boards, so I guess you have no experience in this game. That means that you are unable to make my score (right now is 732, later I'll get >740). No I mean specifically for soccer games. And here comes the explaination. 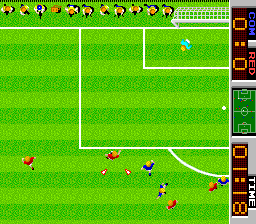 Soccer games have always some kind of cheesy tile/position where you can score systematically. The hard part all comes from reaching that spot without any defender that obstructs the shot or tackles you in the process. By always I mean *always*, all of the above is common knowledge and applies to newer games such as Winning Eleven or FIFA too (except of course you need way more hours to get them). Minus the diagonal shot of course. Of course things are not so simple. So... try this game and let's see if you can finish it.